Stop messing about and tell me what you mean! Ah, I see! This is one of those "Unbuilt" motorways, then? Can you show me where it was supposed to be on a map? This motorway was kicking around in the planning section of the Department of Transport from at least the late 1960s, until its final cancellation in the late 1990s. It had its roots way before then, though - a route along this corridor was included in Abercrombie's Greater London Plan of 1944, as Radial Route 7 - a name it was to keep alongside M12 for a very long time! Whilst almost none of the actual motorway was built, you can see where it was supposed to end: here, right on the middle of the London end of the M11. If you look carefully, you can see the bridges over nothingness put into place ready for the M12! The first part of the M12 was referred to as the South Woodford - Brentwood Motorway, basically going from the current southern end of the M11 out of London. This would have headed generally though the area to the north of Redbridge and south of Hainault, heading generally eastwards before turning southeast just north of Havering-atte-Bower (where there was to be a Service Area), and meeting Ringway 3 (nee M16, now M25) just north of junction 28, and would have ended on the Brentwood Bypass. A scan of DoT documentation referring to this section dating from the early 1970s can be seen here. The second plan was all tied in with London's proposed third airport, at Maplin Sands, near Southend-on-Sea. The M12 was designed to speed folk there, and alongside all the way was a high-speed rail line, making for some interesting proposed junction layouts! The most likely route for this section was to use the Brentwood route, then continue alongside Ringway 3 for a short stretch, before heading eastwards one more just prior to M25 junction 29. This would have followed the A127 corridor (although a little to the north), and avoided Rayleigh to the north, showing a pronounced "hump" in the route. From north of Rayleigh, it would have headed south of Hawkwell and Rochford before finally terminating at Maplin Airport. It has to be said, however, that this is simply the most likely route - a number of other possibilities were put forward, and no definite final route was ever selected. 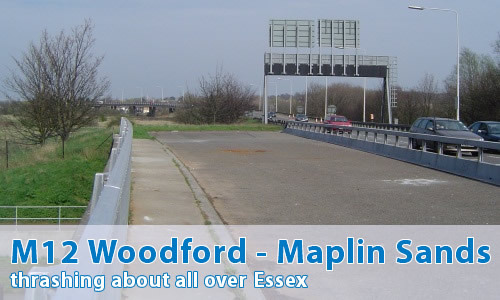 The third scheme was from the M25 out to Chelmsford, to the north of the modern A12. A map from DfT documentation from the 1990s can be seen here. That all seems a bit complicated? Have you got some maps with it all on? As it happens, yes, I do. As a Brentwood native I can remember these proposals popping up in the local paper from time to time. Weald Country Park (to the north west of Brentwood) and near to where I lived always seem to be mentioned as under threat. But that could just have been scaremongering by the paper. The last suggestion as a cut-the-corner route from the A12 to M25 was I believe just to avoid the delays on the Brentwood by-pass. In the end they just re-engineered the slip roads to and from the Brook Street roundabout. (M25 Jnc 28). Had the Maplin Sands idea taken off, I wonder if there would have been a massive junction at Brook Street of the M16, M12, A12 and A1023? That would have been an interesting one. When the M11 was built I also understood that there were plans to build the M12. I was under the impression that its route would have gone through the playing fields at my old school, Fairlop Junior School in Colvin Gardens, Barkingside , Ilford Essex. It would then have run through Fairlop Evangelical Church and out over the Fairlop Plains, over the Central Line and up towards Hainault Forest. Only now I find out the playground of my youth should of been a motorway...I'm shocked. I lived in Woodford Bridge in 1978-90 the hum of the M11 used to ring in my ears all the time and the joy of seeing a norfolk line trucks go past - I still tingle now.. It's a great shame that we can't have decent motorways that were planned 35-40 years ago. It's all a case of NIMBY and we all suffer for the few. We desperately need the M12, so let's start lobbing MPs to get back on track to relieve congestion. More people need more roads, this will help reduce pollution as moving traffic is better for the environment than crawling traffic.